This is a 300 sq. ft. mobile surf shack in Santa Barbara, CA. It was designed by Alex Wyndham. Plans available here. What do you think? How cool is this! Love the layout and especially Retractable glass wall window thingy. loft would be better with a railing. Don’t want to fall off the edges. Good call! Easy to add too! That is true Tanya but in the middle of the night in the dark it may well be. That bench is going over before they do ! No bench where the stairs are. IMO, that gap between the bench and the stairs isn’t wide enough to pose a serious risk… People flail about when they’re moving in the dark, trying to feel their surroundings. So you’ll definitely contact that bench before reaching the edge of the loft and you’d similarly will feel the edge of the stairs with the landing being wide enough even if you miss you’ll just land about a foot below before worrying about the rest of the stairs. I agree James but I am a person that does not like to leave safety to what ifs. I would put a hand rail and never wonder again. Safety is always the safest way. Forgot your last comment James, clap-on, clap-off? How do you cook food? How do you keep food cold? 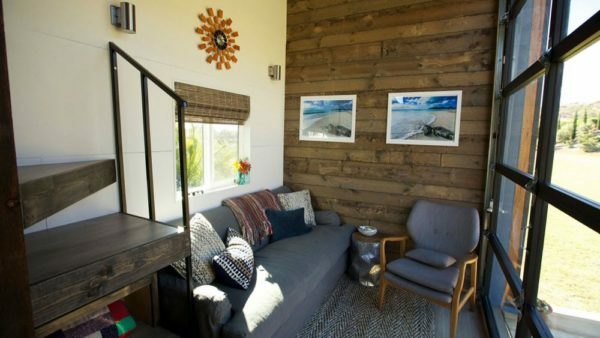 Older post: Pen Sardine Tiny House: An Aerodynamic, Teardrop-like THOW!